Here we will describe a simple method to measure attack and defence power of football team. First we need some information for every team before we start building our model. This statistics is available for every league on standing page. Overall - Average number of goals scored and condeded. Home - Average number of goals scored and condeded. Away - Average number of goals scored and condeded. 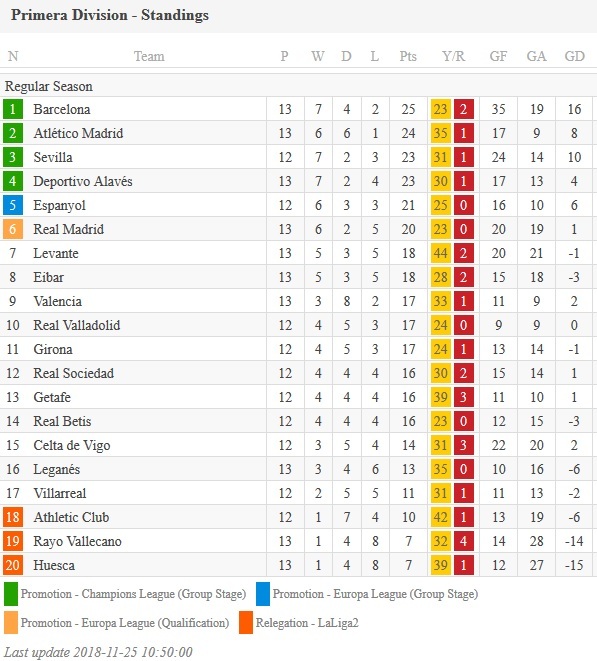 In this example we use our standings for Spain Primera Division. Total played matches now are 125. GF /Goals for/ or scored goals are 170. GA /Goals against/ or conceded goals are 147. Average scored goals for match is (total scored goals ) / (total number of matches). 170 / 125 = 1.36 .We do the same with conceded goals 147 / 125 = 1.18 . Next step is to calculate this for every football team. We are not going to do this for every team just for 1 and for overal attack and defence power. Lets take Espanyol. They have 12 matches so far GF - 16 and GA -10. Average GF is 16 / 12 = 1.33 and average GA is 10 / 12 = 0.83. Now devide (average team GF) / (league average GF) or 1.33 / 1.36 = 0.978. It is rounded to 0.98 in our table below. 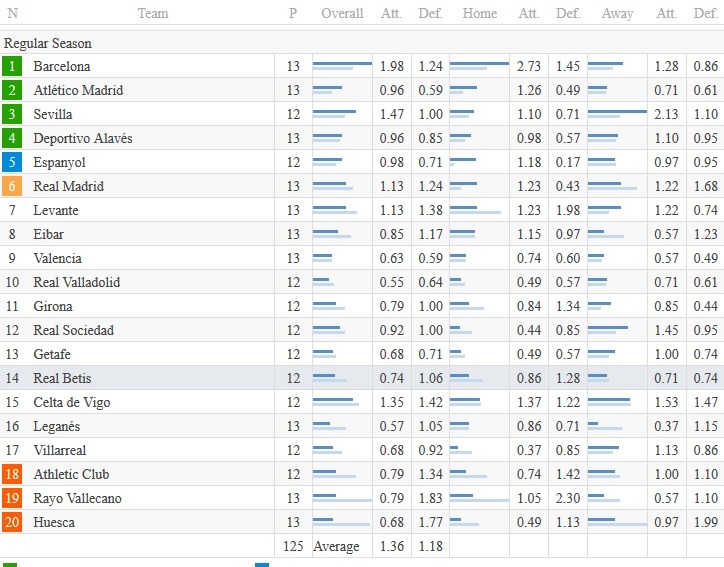 0.98 is overall attack power of Espanyol, but what this number means. If we convert this to percents Espanyol are scoring 98% of average league golas, 2% less than average. It is clearly that attack power should be > 1.00 for teams with good attack. Now we do this and for defence 0.83 means that they receive 83% of average league goals. But for defence it is better to get fewer goals, so defence power < 1.00 is better. Lets now try today clash between Espanyol and Girona. Calculate expected goals for both teams. All bookmakers also bet on Espanyol to beat at odds around 1.60. Like every sport and in football too there are "surprises". Girona beat with 1:3 with two fast goals in 4 and 6 minute. I took this match becouse it start when i start writing. Now lets look what our software think about this match. It is clearly that we do not cover 1X tip, but look at 22% probability for Girona. If we convert 22% into odd it is 1 / (22/100) = 4.545 ,which is value bet i think. On next post i'm going to reveil some more football methods.